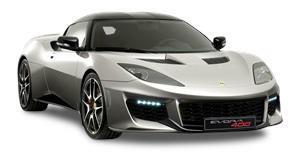 The fastest and most focused Lotus Evora ever is finally coming to the US. It will be worth the wait. While the ludicrously lightweight Lotus Evora 410 Sport has been on sale in most territories since last year, North American customers have to wait until this summer. Just to rub it in, Lotus also launched a one-off 410 as a tribute to the James Bond Esprit S1 submarine. Last year, Lotus made its long-awaited comeback in the US with the return of the Evora 400, and to mark the North American launch of the 410, the British sports car manufacturer has revealed a limited-edition model available only in America. Called the Evora Sport 410 GP, the unique model sports a black and gold paint scheme in homage to the iconic Team Lotus F1 racing livery used on famous racecars between 1976 and 1986, from the Lotus 72 and Lotus 79, to the Lotus 98T. The catch, though, is that the Evora Sport 410 GP Edition will be limited to just five examples through the Lotus Exclusive program. As the fastest and most focused Evora ever, the Sport 410 should be well worth the wait when it finally arrives in the US. It’s had an impressive weight loss of 132 lbs compared to the Evora 400 which wasn’t exactly heavy to begin with, weighing just 3,020 lbs. Take out the fuel and install the optional lightweight components, and the Sport 410 tips the scales at 2,910 lbs. Its supercharged 3.5-liter V6 produces 400-hp and 301 lb-ft of torque. As standard, the Evora Sport 410 is fitted with a six-speed manual gearbox, or you can opt for a six-speed automatic with paddle shifters. 0-60 mph takes 3.9 seconds and it will reach a top speed of 190 mph, making the Evora Sport 410 the fastest Lotus to ever be sold in the US. Lotus has had considerable success in America since it returned last year, with the next six months of the market’s allocation already spoken for. You probably won’t be seeing many Lotus Evora Sport 410 models on US roads, though, as production is limited to just 150 examples worldwide. Prices start at $104,200 MSRP, while the limited GP Edition will set you back $110,000 MSRP.